With CRERAYS, tenants in the market tell us, in detail, what requirements they have and we send those requirements on to real estate professionals who have signed up with our site. There is no cost to receive notifications. If a real estate profession is able to fill those requirements, they respond with a custom proposal and work directly with the customer. In a way, you can think of it as "on demand" for real estate. Despite advancements in technology, the way commercial real estate is marketed has never really changed. Whether it be in traditional print advertisements, online or even on social media and photo sharing apps, owners, brokers, and lease holders essentially create an advertisement of the property they have to offer, hoping someone interested will see it and contact them. To us, this process, while traditionally sufficient, is clearly not efficient. It is costly to those posting ads, and largely a waste of time and resources of those looking for space. We sought out to find a better way; to make the process easier, more enjoyable, and cost effective. The answer was simple. We've created a way for those looking to rent to tell the real estate world, in as much detail as they can, what they are looking for, and have those professionals contact them directly with what they have to offer. Amazingly, no one has taken this approach to real estate before. "Hot Leads" are sent directly to the professionals in our network, who can choose to respond with space they have available. This will not detract from a Real Estate Professional's personal or company website, social media outreach, or even paid advertisements and listings with conventional sources. Real Estate Professionals, can leverage those assets and include them in their responses. We just recently launched and are building our network of professionals, so that we promote our site to the ultimate end user of the real estate, the tenants, there will be enough people on the professional side to field the requests that come in. 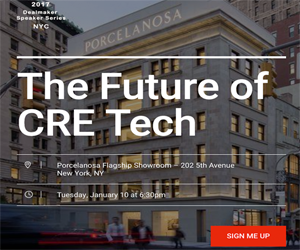 I think the current state of the real estate tech sector has hit the puberty phase. I think there is a general consensus of what will emerge, but right now we are going through a lot of changes, growing pains, testing the boundaries of what is possible, and trying to gain a level of respectability and reliability. Right now we are focusing on our local markets, NYC, the greater metro area and NJ. From there we will venture out and will be in every market in the country. Our model will work in any place in the world. Beyond that, we will be looking to expand into other related fields, such as interior design, architecture, furniture, insurance, IT and telco services. Ultimately, we would like to become a centralized marketplace for people to connect over commercial real estate, process their deals and coordinate all the parties involved to get someone into a space and that space up and running.